My cousin’s daughter is having a baby and I know just what to give her for a baby shower gift–a copy of my picture book The Peddler’s Bed. That was an easy decision. 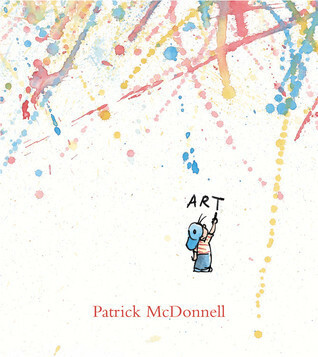 Of course, you don’t have to be an author to give picture books as gifts. I may be a tad biased, but I believe a picture book is the perfect gift for a shower, a birthday, Christmas, any special occasion, or for no occasion at all. It’s a story and pictures wrapped up neatly between two beautiful covers. What’s better than that? Not much. 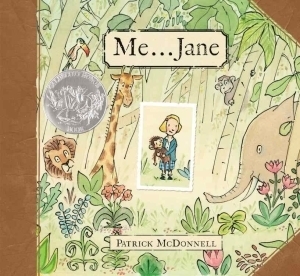 But have you ever thought of giving a picture book instead of a card? Today, author Karlin Gray stopped by to tell us why picture books make the perfect greeting cards too! As my son’s reading interests shift from picture books to chapter books and graphic novels, I have been moving books from his shelves to mine. In doing so, I was reminded of a wonderful thing that my family and friends did at my baby shower. Instead of a card, guests gave me their favorite picture book. They wrote their good wishes to my “Baby” (since we didn’t know the gender) on the inside cover pages. Eight years later, the gifts of bottles, bibs, and binkys are gone. But the picture books are still here. At some point during those early sleep-deprived years, I started pasting friend’s holiday picture cards next to their signature in the books. This way, my son could connect the book to the person who was kind enough to give it to him. I treasure all those notes like “Eat up all the joy to come!” (My tiny co-worker with a huge appetite wrote in The Very Hungry Caterpillar) and “Enjoy the music!” (My childhood friend with a hippy heart wrote in Free to Be You and Me). Other books given were You Are My I Love You, Kitten’s First Full Moon, On the Night You Were Born, A Treasury of Curious George, If You Give a Mouse a Cookie, Goodnight Moon, and Where The Wild Things Are. And because I ended up having a baby who wasn’t too fond of sleeping, these books were read to him at a very early age . . . again and again. Today, I continue this gesture, giving picture books as baby-shower cards. 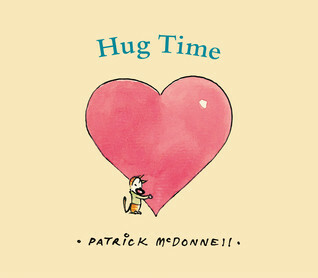 My go-tos are usually by Patrick McDonnell: when it’s for a boy—Art; when it’s for a girl Me, Jane; and when it’s for “Baby”, Hug Time. Certainly, buying a picture book instead of a card is more expensive. (Board books are a nice option, priced around $3-5 and drool-resistant!) But it will not end up in the trash or stuffed into some box in the closet. It will be part of the child’s world for many years and a lovely reminder of the person who found just the right card—picture perfect! 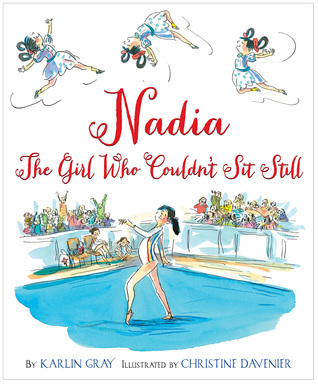 Karlin Gray is the author of NADIA: THE GIRL WHO COULDN’T SIT STILL, a nonfiction picture book on Olympic gymnast Nadia Comaneci. Visit her at karlingray.com. What a lovely post. I agree that picture books make the best of presents for baby showers and birthdays. You received some great titles as gifts, and it is a lovely idea to put photos of the generous gifters beside their signatures. How easy for you, Lauri, to gift your own book. What a lovely surprise to receive a book from, and signed by, the author. I always give books as gifts. I have become rather predictable in that over the years. For baby showers I now give a picture book or two, often “Ten Little Fingers and Ten Little Toes”, along with 2 books for the parents: “Reading Magic” by Mem Fox and “Good Ideas: How to Be Your Child’s (and Your Own) Best Teacher” by Michael Rosen. It is a lovely package that first-time parents have very much appreciated. The benefits of sharing picture books can last a lifetime! Hi Norah, Thanks for commenting! I agree, the benefits of sharing picture books are immeasurable. I love to gift picture books to my two littlest nephews and make sure to include one or two for each of them for every birthday and Christmas. I love this. The women hosting my shower have requested that people partake in the book instead of card theme. I’m so excited to share them all with our baby.